Designed for people. It is a simple but effective maxim that is often forgotten in an age when we are inundated with commercial design in everyday life. For FG Stijl, designing for people was the development of a bold concept generated from their own countless three-dimensional experiences, and now, more than a decade on, it has become somewhat of a mission statement for the firm. FG Stilj was founded in 1995 by Colin Finnegan and Gerard Clintmeijer. As well as designing for exclusive restaurants such as the 3 Michelin starred Parkheuvel, they have also gained critical acclaim having recently won the Prix-Villegiature Paris award for 'Best Interior Design of a Hotel in Europe' for their work on the College Hotel in Amsterdam. 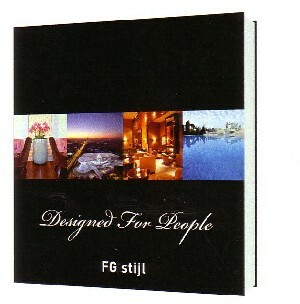 "Designed for People" provides an inspiring walk through the most beautiful international creations of the architecure and design agency FG Stijl based in Amsterdam.